The Australia Council have announced the winners of their MMUVE IT! project. The project had thirty thousand dollars up for grabs for a virtual world arts initiative. The winners this time are visual artist Andrew Burrell from Sydney and artist and science researcher Trish Adams from Brisbane. The third real winner this time is startup virtual world platform VastPark, which will be the co-host of the final exhibition along with Second Life. 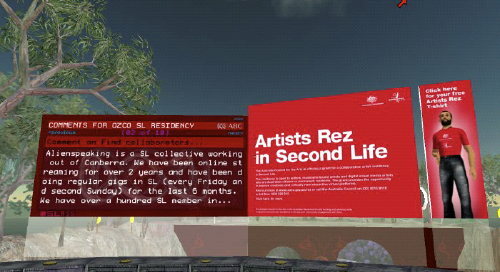 The winning proposal involves “an inter-disciplinary artwork exploring brainwave activity and body movement and its relationship to virtual environments in both Second Life, and the recently released Australian virtual platform, Vastparks* (sic) …. a human/computer interface system that explores the artistic possibilities of neuroscience studies. The system will allow viewers to interact with artificial life created in virtual worlds through sensor readings of bodily functions including physical gestures, breath, heartbeat or electrical brain and nervous system activity”. Also involved will be Professor Mandyam Srinivasan, head of visual neuroscience at the Queensland Brain Institute of the University of Queensland (Trish Adams is currently an artist in residence there). We’ll catch up with at least one of the team behind the project in coming weeks – after the artistic success of Babelswarm, it’ll be interesting to see a further evolution of Australian virtual world-based arts.